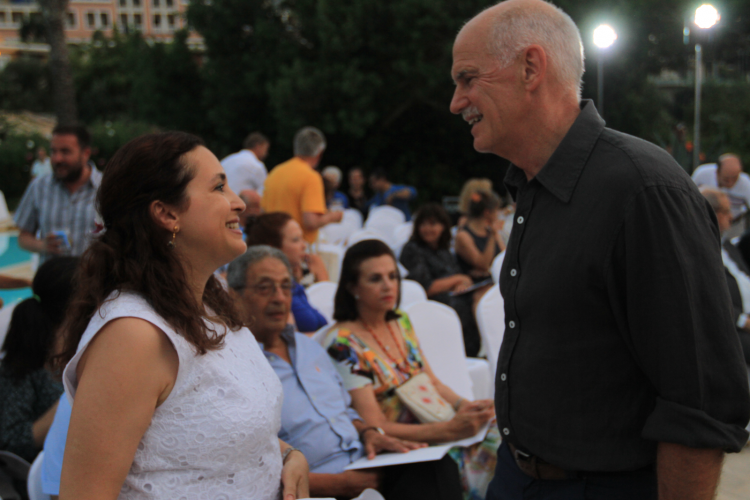 George A. Papandreou (born June 16, 1952) is Former Prime Minister of Greece, current President of Socialist International, a Member of the Hellenic Parliament and former President of the Panhellenic Socialist Movement (PASOK). He served as the 11th Prime Minister of Greece from October 6, 2009 - November 11, 2011, after PASOK’s victory in the October 2009 national elections. Tonight we come together, all our participants of the Symi Symposium, to celebrate a first step in making a long standing dream come true. A dream I shared with my good friend and colleague Ismail Cem. Ismail was a charismatic personality, a courageous politician. When I was nominated Foreign Minister of Greece, in 1999, it was almost three years after the Imia crisis that nearly brought on a violent conflict between Greece and Turkey. These events, were the culmination of mistrust between our two countries. A mistrust that in recent history had its roots in the Cyprus problem but also the issue of the Continental Shelf in the Aegean . These conflicts had created years of frozen, tense and even dangerously volatile relations between the two countries. I was convinced that this impasse – or even worse – a war between Greece and Turkey could be catastrophic and certainly undermined the true potential of both our peoples. As well as the potential for Cyprus. We needed to find new ways to look at our relationship and innovative paths to resolve our differences. But there was no certainty that we could change an existing paradigm, one of heated rhetoric, fear, mistrust, mutual recriminations, which of course were linked with real problems. But I decided that there was no reason to be in the position of Foreign Minister if I didn’t tackle head on our major foreign policy issue. And that was of course our relations with our neighboring Turkey. In soon received a letter from my counterpart Ismail Cem. Some , saw it as an ultimatum which should be summarily rejected. I decided to interpret it as an opportunity to initiate an honest exchange of views. So we began by exchanging letters. Then the Kosovo war broke out. And media, BBC and CNN, were justifying NATO’s intervention by stating that the conflict in the Balkans would engulf Greece and Turkey in a regional war. I called Ismail Cem for the first time. I said – we have our problems but are we going to war over Kosovo? He said – certainly not! So I suggested we make a joint statement in NATO that Greece and Turkey were not going to go to war over Kosovo. We did and furthermore – we agreed to work together to bring humanitarian aid to the displaced persons of the war. A few weeks later – Ismail Cem and I had our first bilateral meeting at the UN – where we were summoned with others on the conflict around Kosovo. I found a kindred spirit. On Ismail’s suggestion we decided rather than fight about our differences to begin a dialogue on areas of possible cooperation. Or to solve less dramatic problems. Or cooepration on epidemics concerning agriculture. Maybe luck was on our side. But certainly I found a counterpart ready to take bold decisions with me. And though we had many differences – what I found in Ismail was a person I could trust. Trust – despite our disputes. Despite our disagreements. A trust, an honesty and a will to seek out solutions a road map forward for peace and cooperation. While analysts, often like to refer to our rapproachment as a result of “earthquake diplomacy” in fact our cooperation began months earlier. When the earthquakes struck first in Turkey, in August 1999, the time seemed ripe to call on the greek people to show solidarity with the turkish victims. The response was amazing, civil society in Greece, seemed to have thirsted for this opportunity – one to show that there was a different way. And the most moving moment was when a greek fireman, after hours of digging, pulled out a young turkish boy, alive from the concrete ruble. A month later the Turks responded in the same way when Athens was hit by an earhtquake. A team of Turkish volunteers, created by Sarik Tara – whom we are rewarding tonight – came to help. Ismail and I felt knew we needed to create momentum. In only a year or two we had signed over 30 agreements. After fourty years of no cooperation whatsoever. Ismail and I worked closely together to create a new public discourse of cooperation. One such sympolic move when we both planted an olive tree on the island of Samos – the nearest island to Turkey. I took an olive branch from that island and placed it on his grave some years later when he passed away. After many years, and in honoring a nacsent but very important friendship between our two countries and citizens, we decided with Ismail Cem’s family, with Ipek, to honor his memory and our common dream. We thought that it will be symbolic to announce this Prize, in the framework of the Symi Symposium, a forum where an important number of personalities coming from conflict areas have the chance to meet and build bridges of communication. We are going to organize also a special event in Istanbul where we are going also to announce the members of our Jury for 2016. 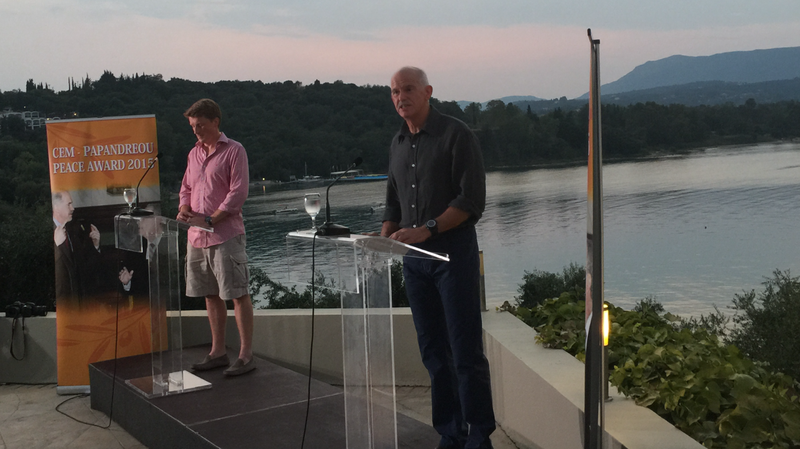 For 2015 , we decided to give symbolically the Cem-Papandreou Peace Award to two enlightened individuals, from the business community, Theodoros Papalexopoulos and Sarik Tara. They have contributed consistently to keep alive the spirit of peace and understanding between Greece and Turkey. As they cannot be here today with us, they will receive their Award in Istanbul. For 2015, we decided also to give an Award to a committed group of politicians, diplomats, entrepreneurs and opinion leaders from Greece and Turkey that contributed all these years in an innovative, quiet and productive way in providing ideas for resolving problems and keeping open channels of communication even in the most difficult moments of our recent history. They have produced a unique paper on the Aegean and decided to broaden their scope of their efforts by creating a Cyprus chapter . I hope that in the months to come , the vision of peace will prevail in Cyprus and we will have the opportunity to plant together , with the Greek Cypriot and Turkish Cypriot friends an olive tree in a reunited island.